Illuminating Designs by Connie has some truly extraordinary creations. Her jewelry is described as “wearable works of art” and I completely agree. I love crystal jewelry and this necklace is particularly striking to me. I love amethyst! 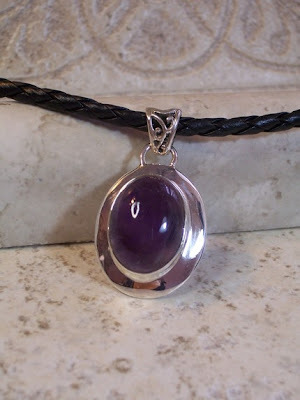 This necklace is called Chunky Amethyst Pendant Necklace. I would love to own it! Moonstone is said to be stone that is said to be protective to women and babies. I’ve heard that if you are trying to get pregnant or are pregnant that you are supposed to wear moonstone. 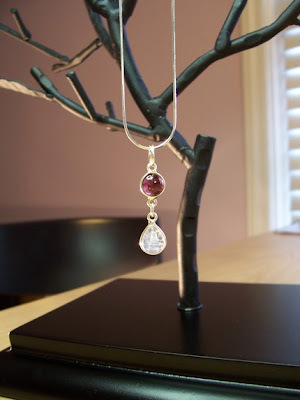 I’m not pregnant now nor do I plan to be in the future, but I would still wear this gorgeous Dainty Garnet and Moonstone Necklace. Connie also has a Twilight section!!! 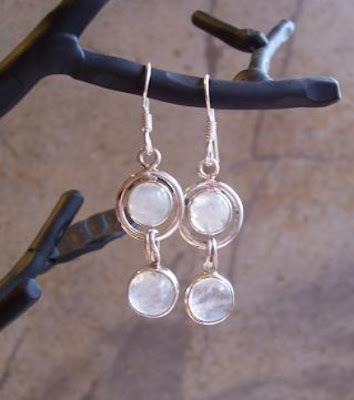 I am in love with the Bella Moonstone Earrings. There are so many other ones that I love that I don’t have room to mention them all here! To tell you bit about myself, I’m a very Spiritual person. I’ve been almost every religion you can imagine, and my personal choice response when asked, What denomination are you?, is I’m a Christian. I consider myself to be an open minded person and treat all individuals with God’s love, no matter their religion. I’ve lived in the West (Scottsdale, Arizona), the South (Dallas, Texas), and currently live in the East (High Point, North Carolina). The Lord has blessed me in so many ways. I’m not one to stay still for very long! I love people and love creating beauty. My passion for art comes through in my jewelry designs, where my spirituality also shines through. Each piece of my jewelry has blessings in store for it’s wearer! In designing my jewelry creations, I carefully select Semi-Precious Stones, Beautiful Minerals, and Unique Findings to create a look that is striking and timeless. The best part of all is that you won’t find anything in a store as unique, elegant, classy, and affordable as I can provide through my Etsy Webstore (Established September 25, 2008). I love semi-precious stones and minerals of beauty such as Moonstones, Crystals, Rose Quartz, Amethyst, Rubies, Pearls, Moonstones, and Hematite, to name a few. During my years of living in Scottsdale, Arizona where I traveled to Sedona frequently to go hiking in the mountains, I met several Navajo people. There I learned a deeper sense of spirituality and creativity. 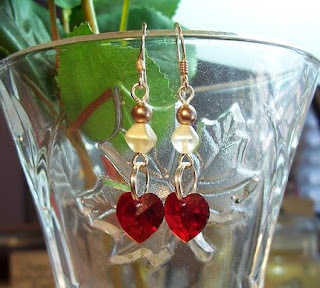 In all of my jewelry designs, you’ll see healing stones with a contemporary flair and lots of sparkle. As each piece of jewelry signifies a special moment in time, to my clients I’m happy that I could be a part of their life in their simple indulgence. I know they will enjoy my jewelry collection(s), whether going to a special event or simply running errands with style! Illuminating Designs by Connie has offered my readers a chance to win one item from her shop ($15 and under).